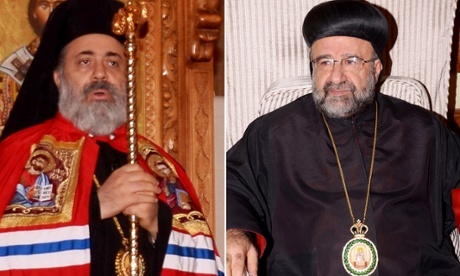 Damascus, August 24, Interfax - Mor Ignatius Aphrem II, a leader of Syrian Christians and patriarch of the Syriac Orthodox Church, has asked Russia to assist in the release of the metropolitans captured in Syria three years ago. The issue was addressed in a meeting between the patriarch and Russian Ambassador to Syria Alexander Kinshchak, the press service for the Syro-Jacobite Church said. “In light of the recent successes on the battleground near Aleppo, and also the improvement of relations between Russia and Turkey, His Holiness called on the Russian government to resume efforts on that track [the hierarchs’ release],” the report said. Militants from the Syrian military opposition captured Metropolitan Paul of Aleppo, the brother of John X, Patriarch of Antioch, and John Ibrahim, the Syro-Jacobite Metropolitan of Aleppo, near Aleppo in April 2013. Their driver, a deacon, was killed. They had been involved in humanitarian operations in the village of Kafr Dael, located near the Syrian-Turkish border. The media periodically publish reports stating that the hierarchs have been released or killed. Syria’s Grand Mufti Ahmad Badreddin Hassun previously said many times that the Turkish special services were involved in the capturing of the two hierarchs, linking it to Turkey’s requests for the transfer the Antiochian See from Syria to Turkey and the attempts to put pressure on the Patriarch of Antioch and All the East in this way.